Prescription foot orthotics are custom made inserts for your shoes designed to address various foot and lower body conditions. The manufacturing and materials used vary based on patient needs, activities and health factors (see Types of Foot Orthotics). Orthotics are often prescribed to accommodate various "wear and tear" foot conditions such as plantar fasciitis(heel spurs), metatarsalgia and soft tissue degeneration. Foot orthotics can also assist in the care of lower body conditions like back pain, diabetic ulcers and knee problems. It is important to remember, foot orthotics are one aspect of a treatment program and do not replace other forms of therapy. We urge you to follow all recommendations from your other health professionals. To determine the most appropriate type of orthotic for you, please contact our office for an appointment. 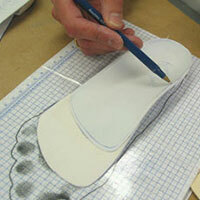 Proper footwear is the most important partner for foot orthotics. Orthotics need a strong, stable supportive base; avoid poorly constructed, non-supportive footwear. 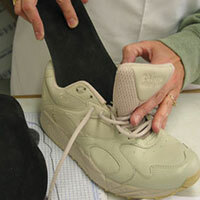 We recommend to purchase footwear from a salesperson who is experienced in fitting orthotic users. How does an orthotic help? An orthotic is a custom made device that controls the amount of excessive pronation and supination that a foot goes through when walking, running or cycling. All people naturally pronate and supinate but excessive movement either way can be problematic. Pronation control shoes or shoes with stabilizing features help to control wearing of the shoe while orthotics help to control the stabilizing and mechanics of the body.